RadChartView for Android is a charting component that has been designed for the mobile environment. It offers great performance in loading time, drawing capabilities and real-time updates. Its intuitive object model and public API allow you to easily setup complex chart objects and integrate them into your application. The control supports different chart types (and series) organized in hierarchies, depending on the coordinate system, used to plot the data points—for example Cartesian (RadCartesianChartView) and radial (RadPieChartView) coordinate systems. 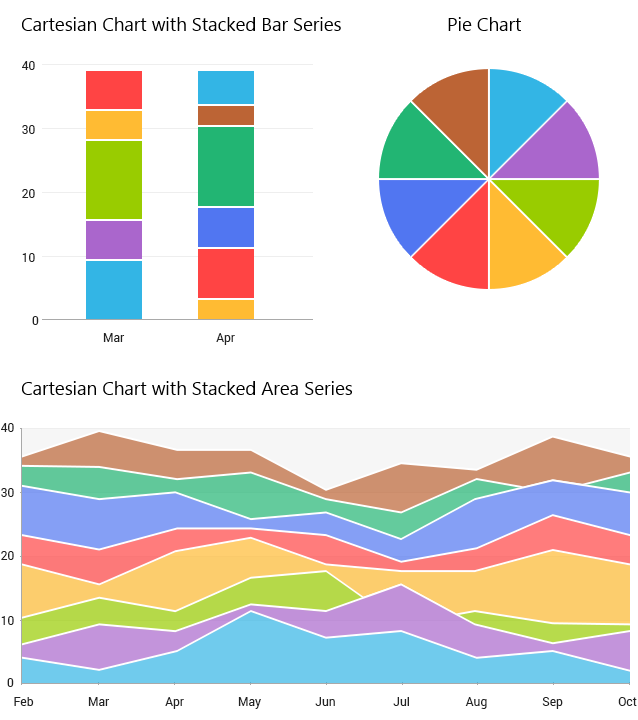 RadCartesianChartView: As the name hints, this concrete chart control uses the Cartesian coordinate system to plot the data points in its chart series. The X and Y axes define how each point’s coordinates in the plot area are calculated. RadPieChartView: This concrete chart control visualizes its data points using radial coordinate system. Each data point is represented as a slice from a pie. The ratio between the space consumed by each slice and the space consumed by the whole chart is the same as the ratio between the value of the data point that it represents and the total value of all data points in the series. If you choose the Cartesian chart, you need to specify the type of each of the axes—horizontal and vertical—and the type of the series. Depending on the type of the series, you will need to choose axes that can visualize category or value (usually one axis to visualize the category and one to visualize value). CategoricalAxis: Arranges the plotted data points in categories where the key of each category is the point's value (if available) for that axis or its index within the points collection. The point's coordinate, specified by this axis is discrete and is calculated depending on the size of the category slot where the point resides. DateTimeCategoricalAxis: This is a special categorical axis that expects each data point to provide a java.util.Calendar structure as its value for this axis. The points are grouped by a user-defined date-time component (Year, Month, Day, etc.) and then the groups are sorted chronologically. DateTimeContinuousAxis: This is a special axis that expects each data point to provide a java.util.Calendar structure as its value for this axis. You can think of DateTimeContinuousAxis as a timeline where the coordinate of each data point is calculated depending on the position of its associated DateTime on the timeline. The base unit (or the timeline step) of the axis is calculated depending on the smallest difference between any two dates. LinearAxis: Calculates the coordinate of each data point, depending on the actual numerical value this point provides for the axis. A LinearAxis exposes Minimum and Maximum properties to allow for explicit definition of the range of values visible on this axis. If these properties are not specified, the axis will automatically calculate the range, depending on the minimum and maximum data point values. LogarithmicAxis: Special linear axis that will transform each data point value using the logarithm function. Using LogarithmicAxis allows your app to show numerical data with huge delta between the minimum and the maximum to be visualized in a readable way. LineSeries: Visualizes a collection of data points using a Line. SplineSeries: Visualizes a collection of data points using a Curve. AreaSeries: Represents a chart series that are visualized like an area figure in the Cartesian space. SplineAreaSeries: Represents series which define an area with smooth curves among points. BarSeries: Represents a chart series that plot their points using rectangular shapes, named "Bars". RadCartesianChartView can display BarSeries both horizontally and vertically. If the series are more than one, they can be stacked. RangeBarSeries: Represents a chart range bar series. Both BarSeries and RangeBarSeries display its data points as bars. However the bars in BarSeries represent just a single value and the bars in RangeBarSeries represent low value and high value. DoughnutSeries: The DoughnutSeries are similar to the PieSeries with the difference that the data points are visualized in doughnut segments. PanAndZoomBehavior: This behavior handles touch events to enable panning and zooming of the associated chart plot area. RadChartView allows custom decoration over its plot area. You can adds lines and stripes which connect the tick of each axis. You can set a new grid with the method setGrid(CartesianChartGrid) in your chart instance. Read the Grid Section for more information. The Chart Palettes are a set of predefined values that you can use to set colors of a chart. RadChartView gives you options to define your own palettes and to use the ones we have prepared for you as well: "Light" and "Dark". CartesianCustomAnnotation: This class exposes the functionality of adding user-defined annotations to the RadCartesianChart. RadChartView can display different labels for the series and axes that are displayed. The labels can be fully customized according to your preferences. RadChartView supports a legend that facilitates the reading and understanding of the displayed information. The legend can be used to easily associate the displayed visualizations with the actual data.